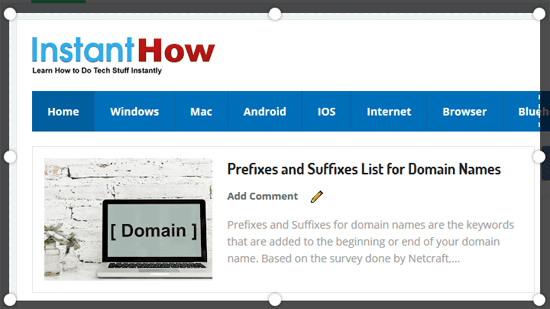 Have you ever wanted to capture screenshot of a website while using the Firefox browser? Maybe you just found a bug on the website you are on and you need to attach a screenshot of the bug along with your report or there is something interesting that you would like to capture and share. Whatever the reason, Firefox browser now comes with a new feature which allows you to take screenshot. You no longer need to follow the usual method to manually hit the print screen button (Command + Shift + 3 keys simultaneously for Mac) on your keyboard, then paste it on an image editing program and crop the screenshot. The whole process is now much easier with the Firefox Screenshots. With Firefox Screenshots, you can capture full page or any region of a page. You’ll then have the options to download the screenshot as a PNG image file format or store the screenshot to a cloud server. There are even some basic editing functions like crop, rotate, highlight, text, and etc. to enhance your screenshot. 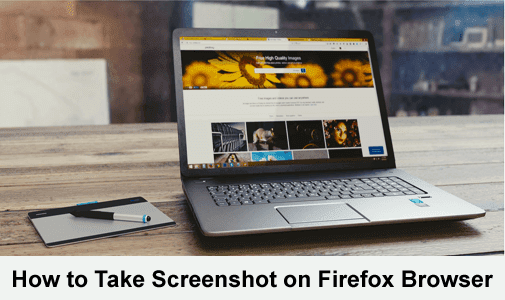 We’ll show you the step by step guides on how to take screenshot on Firefox browser. To start taking screenshot, click on the three horizontal dots icon located in the address bar of Firefox browser. From the menu appears, select Take a Screenshot. If you are taking a full page screenshot, just click on the Save full page button, otherwise drag or click on the page to select a region. You’ll then have the options to cancel, copy, download or save to the cloud. If you select the option to download, the screenshot will be saved as PNG image file format. Click on the Save button to save the screenshot to the cloud. By default Firefox will save your screenshot for duration of 14 days. You can extend or shorten the period by clicking on expiring in 14 days link at the top. Firefox makes it easy for us to share the screenshot. 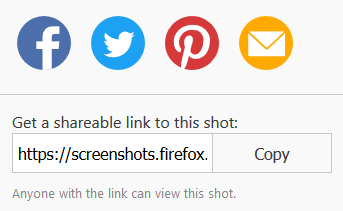 Simply click on the Share icon located in the top right and you’ll have the options to share the screenshot on Facebook, Twitter, Pinterest, Email or through a Shareable link.